We’re not paid by Yummy Earth. We’re (sadly) not paid by ANYONE. So don’t go thinking I’m on their payroll when I tell you that they have yet another amazing product. Sour Jelly Beans. Not the first to the party, but…can they hang with the competition? All natural candies is Yummy Earth’s jam. It’s a lot of other companies’ thing too, but…Yummy Earth does it best. 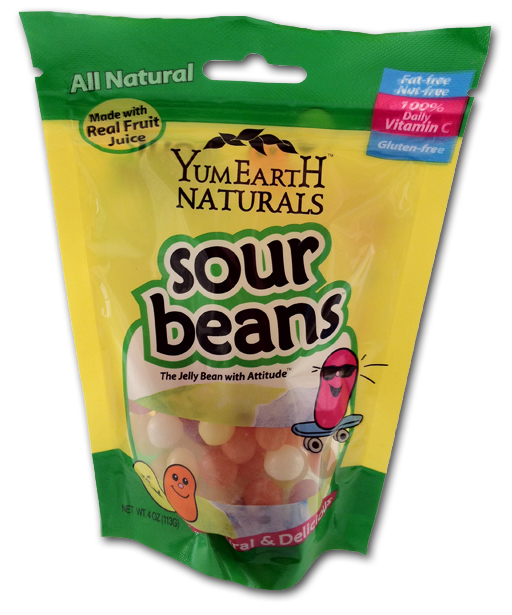 These Sour Beans are made with real fruit juice, real flavors, and real actual ingredients that can be spelled. They even tell you what the ingredients are for : “…tartaric acid (for sour), fumaric acid (for sour), ascorbic acid (for vitamin C),..” That’s a hell of a lot of sour yo! All kidding aside, I never thought I’d like the inclusion of purple carrot juice in my candy, but I do. Here’s the deal. 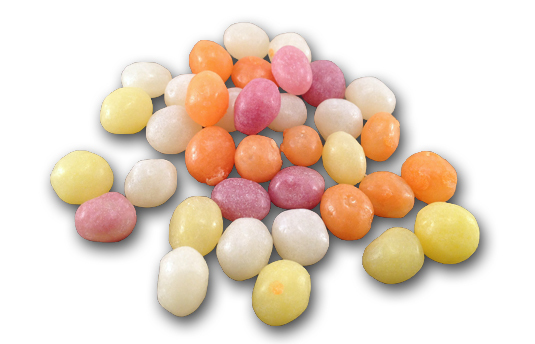 Unlike every other Jelly Bean assortment, these only have have 4 colors. I say colors cause I have no idea what flavors they are. I’m pretty sure the pink is a berry/punch thing, orange is ..orange, and the other two are perhaps lemon and..grape? Dunno. Don’t care. Bottom line here is this: these are better than sour Jelly Bellies. Did everyone catch that? Better I say. And here’s why: first, they have this graininess to them that I love. Second, the flavors, while distinct from each other, combine well. So unlike Jelly Belly, which are great individually, don’t get me wrong, these don’t turn into a non-descript mess when you pop a few different flavors in your mouth. You can still taste the flavors, alone and together. Third, they’re hella low in calories, way lower than any other jelly bean I’ve eaten. The entire bag I ate in one night (sorry!) is somewhere @ 300 calories, and that’s just a delight. To recap, we have all natural, socially responsible, better tasting, not as fat making candy. Why would you NOT buy these? At least try them. Me, I went through my samples and am now frantically trying to find a local store that carries them. You though? You don’t need to worry, there’s a tasty link below that’s just a click away. Look, I’m ready to slam Yummy Earth. I WANT to slam Yummy Earth, simply to do it, because I seem to be a broken record when it comes to their products. But if there’s one thing I know, it’s mid 90’s baseball. Two things, and you can include candy- and this candy is a keeper. Find it, buy it, and then let me know your thoughts.